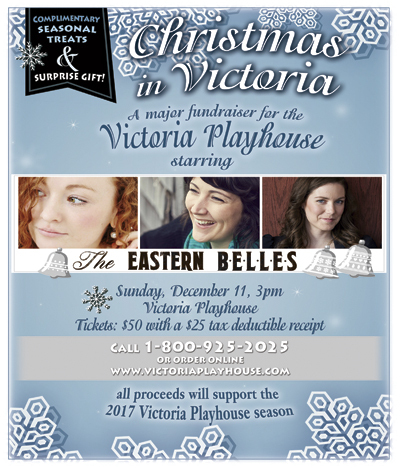 Victoria Playhouse is excited to announce Christmas in Victoria, a fundraising concert featuring the popular trio The Eastern Belles at the Playhouse on Sunday, December 11th at 3:00 pm. All proceeds from this concert will go towards the production of the Victoria Playhouse Festival 2017. 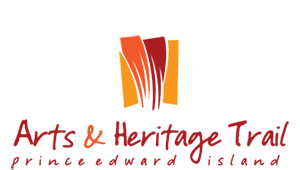 General Manager Pat Stunden Smith explains that the Victoria Playhouse, a non-profit theatre company, depends on its fundraising initiatives in order to stage the Victoria Playhouse Festival, consisting of plays and musical concerts, each year. “We are delighted that The Eastern Belles believe we are an organization deserving of their support and we are very grateful that they are willing to help the Playhouse plan for our next season,” says Stunden Smith. The Eastern Belles took to the stage in Victoria in July of 2016, playing to a sold-out crowd. The Victoria Playhouse would like to acknowledge the generosity of the following individuals and businesses, whose support makes this fundraiser possible: Catherine MacLellan, Ashley Condon, Meaghan Blanchard, Phil MacLellan, House-Front Production Services, The Buzz, Walsh Design, James Clement, and Jonathan Smith. To purchase tickets please call the Victoria Playhouse box office at 902-658-2025 or 800-925-2025 or click onthe BUY TICKETS icon on any page of this website.